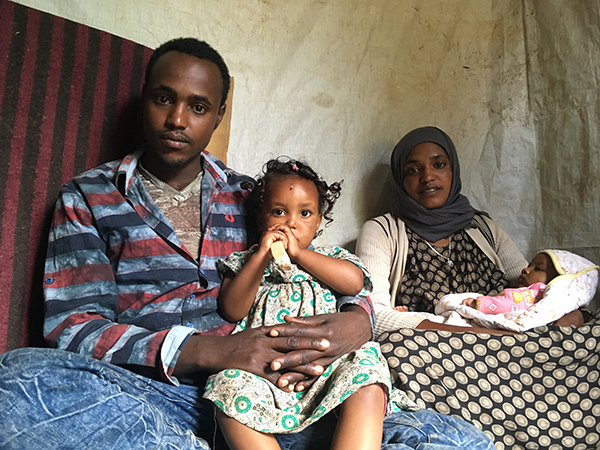 Less than a year ago, Adbi Abbas, his family, and about 2.8 million other Ethiopians were forced to leave their homes because of conflict. They endured much hardship during their resettlement. Then CRS arrived. “We can close our own door now. We have freedom now,” says Adbi Abbas as he leans against the wall of his recently constructed home. Last year, Adbi and his wife, Saro, fled their home located in Somaliland—leaving everything behind. Adbi and Saro arrived in Deder in Ethiopia’s eastern region with 7,800 other internally displaced persons. The influx of people into Deder overwhelmed the local government and the host community. “It was beyond our capacity,” says Azmera Negasa, deputy district administrator and director of the Disaster Risk Management Office. “People were living in our office compounds, schools and abandoned warehouses. Upon their arrival, Adbi and his family lived in an open warehouse with 500 other displaced people. There was no bathroom, access to clean water or privacy to be able to care for their small children. All 500 people were sleeping inside the large hall during the night, and cooking and surviving in the same place during the day. The school-aged children had not attended school since the disputes started. Catholic Relief Services took a holistic approach to humanitarian relief, understanding the importance of not just of meeting lifesaving needs, but also restoring dignity and encouraging social cohesion among the displaced people. CRS hire skilled carpenters from within the displaced population to help construct homes. In addition to shelter, CRS programs repaired water systems, provided health, sanitation and hygiene items, and offered nutrition supplements to children and pregnant mothers. CRS also piloted one of the first cash transfer programs in displaced persons response. Circumstances vary, and the cash transfer allowed people to prioritize what they need, allowing greater freedom and dignity. “I used the cash to buy clothes for my two children—and this,” says Adbi, pointing to the bed and blanket in the corner. However, those in need, as well as CRS, understand that people need more than just shelter to be able to live a dignified life. For the past year, displaced children have not been able to attend school because of upheaval and their families’ lack of money to buy school uniforms and supplies. Today, Adbi and Saro consider their greatest need is for their children to continue their schooling. “We are approaching a year since we’ve been displaced. Our children haven’t gone to school. Our immediate need is to have financial support to send our children to school,” says Adbi. Adbi, Saro and thousands of other displaced families have a long way to go. But with day-to-day survival worries behind them, the future they plan is for their children.